This Westies Rule insulated bottle carrier is my new all-time favorite! Here's a closer view of the machine embroidered Westie applique design from Planet Applique (they call it a Yorkie Puppy, but it's obviously got Westi-tude!). Using software, I flipped the original design and then added the Westies Rule text underneath. If it looks familiar, you may remember I stitched the Westie design on a bib for my nephew in 2010. 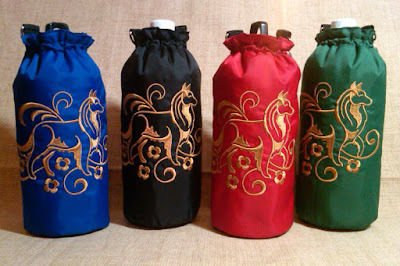 The inspiration to put this particular design on a bottle carrier was gradual. 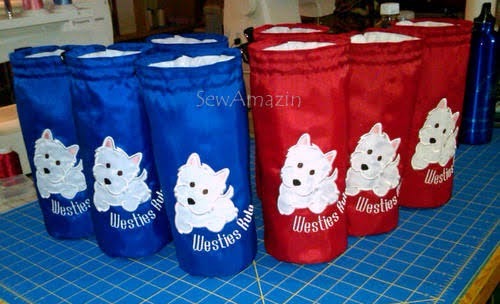 I was thinking about making red and blue bottle carriers with a Westie theme shortly after I saw reusable bottles from Westie Rescue of Tennessee on their Facebook page. Around that time, one of the WRT ladies asked me if I would be willing to donate something for the auction at their annual picnic and she mentioned the Westies Rule design (I was using a sample stitch-out as my personal profile picture). And that was the moment it came together. Both the blue and the red versions are available by request through my ArtFire shop or my SewAmazin shop on Etsy. I've purchased several additional puppy breeds from Planet Applique, including a Doxie, Beagle, Jack Russell and Labrador, so these are available by request, too. I received a request to make bottle carriers with a Sheltie design, but I wasn't able to find an embroidery design that both: 1) lived up to the cuteness of the Westies Rule and 2) was within my stitch count threshold for a bottle carrier. I did find this Graceful Collie design from Embroidery Library, which my customer (who had a Collie in addition to the Shelties) approved for a set of four bottle carriers, one in each color. This is the second of two posts that I began writing back in May of this year....the first part can be found in my previous blog post: Chair Seat Covers, Part 1. This Part 2 post has more photos and a bit more detail about how the seat covers were assembled. As part of the original project, our cousin asked for padded covers for her bar stools to match the kitchen chair covers. The covers for these chairs were a little more complicated for two reasons: 1) they're padded and 2) to fit around the harp, the extension at the back of the seat needed an opening in the middle. I began by making a muslin version of the padded seat cover. To make the basic pattern, I taped a piece of Pattern Ease tracing material to the bar stool and traced the shape of the seat with pencil. It had been a while since I made the slipcovers for my couch and the opportunity to do some 'real' sewing was irresistible. We worked out the details for the project and agreed she would buy the fabric and drop it off along with one of the chairs in January and pick everything up when the covers were finished. The original plan was to make 7 kitchen chair seat covers. I prepared a rough estimate of the fabric yardage so she could order enough fabric, plus a little extra. Have you seen the ads on TV for a curtain made of screening for your patio and sliding doors? We've had one for our sliding doors ever since Keli was a puppy. We usually set it up on the first warm day of spring and leave it there through the summer into mid-fall. On nice days, both Keli and Penny like to go out onto the deck to sunbathe and watch the squirrels, birds and other passers-by. The curtain allows them to go out and come back in when they get too warm and helps keep out most of the insects and airborne objects. At the end of last year, our poor screen curtain was showing its age - the weighted strip had fallen off of one panel and both panels had small rips and tears all over. 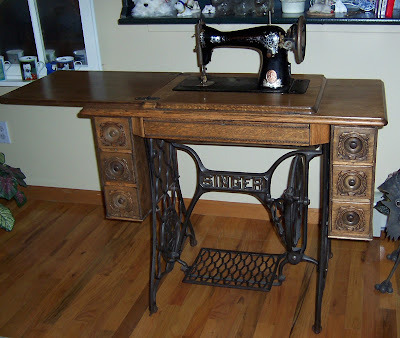 Above is a photo of an antique Singer sewing machine, a family heirloom. My mother passed it to me; she got it from her father. The original owner was his mother -- my great-grandmother. Until recently, I didn't know too much else about the machine other than my mother and grandmother did actually use it for home sewing and that it would probably still work, if it had a belt. The machine shows a good bit of wear -- a good portion of the gold detail is missing from the front and some of the pieces are a bit rusted. I suspect it may have spent a good deal of time stored in the attic or garage once it was replaced by an electric model. The cabinet is in very good condition. 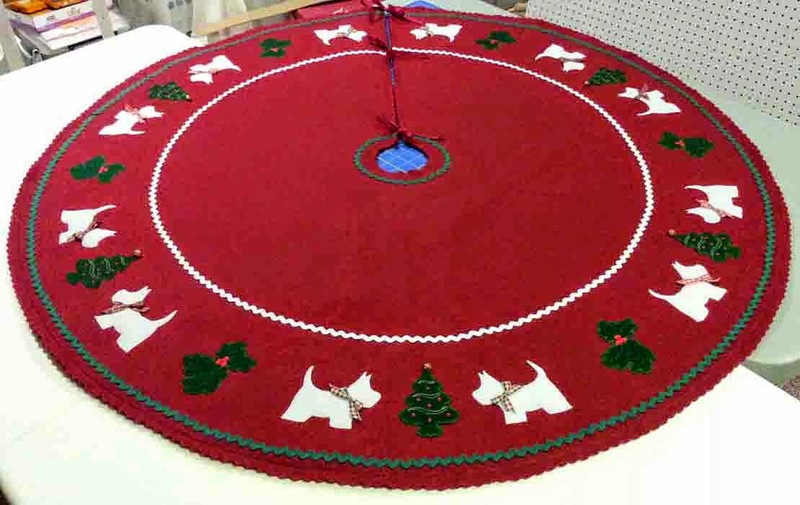 Back in May of 2013, I posted about a Westie & Scottie Christmas Tree Skirt that I made for a friend in 2012. Since that time, I've made a few more and wanted close out 2014 by sharing them here on my blog. Each tree skirt was made of premium craft felt with variations in the layout and designs. In April 2014 I made a variation of the tree skirt and donated it to Westie Rescue of Tennessee for their Meet & Greet and Silent Auction event in May. This version has only 4 pairs of Westies (instead of 6) and they are machine embroidered, just like the Christmas trees and holly leaves (from Embroidery Library's Christmas Heirloom Applique pack).